When a tree falls in the woods it might (or might not) make a sound, but one thing is certain: if a tree falls in Marin County, it's likely to cause a lawsuit. One Stinson Beach resident we'll call Jessem learned this the hard way. The 53-year-old property manager came home one afternoon a few years back to find a big hole through the leafy pittosporum grove bordering his bungalow. His new next-door neighbors (whom the 27-year West Marin resident describes as "hotshot stockbrokers from the city") argued that the trees had been blocking their ocean view. "Then they told me to pound sand," says Jessem. After a year of trying to resolve the situation amicably, Jessem took the neighbors to court. Five months of trial later, a jury awarded him $50,000—half of what he says he spent on surveyors, appraisers and lawyers. Today, the trees, which the jury also ordered the neighbors to replant, are almost grown back, but Jessem says the ordeal killed the Stinson vibe he loved so much. "There used to be a lot more good energy around here," says Jessem, who's scrapped his plans to retire in Marin. He's put his house—and his resurrected trees—on the market and plans to move to Hawaii. Tree-related conflicts in Marin County are on the rise. One culprit is the battle over views; another is the plethora of trees themselves, many of them aging and in disrepair. In towns such as Tiburon and Sausalito, where homeowners pay plenty for unobstructed views of San Francisco, the bay or simply city streets far below, a neighbor's overgrown tree can block a vista of the Golden Gate Bridge and, subsequently, slash up to a million dollars from a home's resale value. In heavily wooded communities, aging trees threaten not only the homes of their owners, but of neighbors as well. Mill Valley is a case in point. There, towering Monterey pines and blue gum eucalyptus were planted for quick landscaping during the development boom of the 1950s; today, these trees have outgrown their roots and started to threaten the homes they originally enhanced. Compounding this mix is the fact that many Marin homeowners have a sense of self-righteousness as high as their property values. Their elevated willingness to fight for what they believe is theirs — whether it's a redwood leaning precariously over a neighbor's roof or a breathtaking view — brings more and more such conflicts into court. 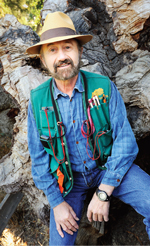 "Marin seems to have an unusual share of tree disputes and litigation," says Ray Moritz, an urban forester and owner of Moritz Arboricultural Consulting in Mill Valley. For 30 years, Moritz has advised California homeowners about arboreal issues and served as an expert witness in tree-related litigation. Marin's biodiversity and hilly terrain, he notes, attract residents who want to feel like they're living in a private forest — and one with great views. "You can't have it both ways." Moritz can rattle off one egregious case after another. There was, for example, the Mill Creek Canyon man who cut down 17 of his neighbor's redwoods while he was away in Hawaii. Why? "He wanted more light." Then there was the Tiburon man who drilled holes and poured Roundup herbicide into dozens of his neighbor's trees, one of which had been planted to commemorate the birth of the neighbor's daughter. "You'd be amazed at what neighbors do to each other." Indeed, says Moritz, most neighbor vs. neighbor tree litigation is — ahem — rooted in an un-neighborly hostility that goes far beyond the fate of an outsize redwood or a drooping black acacia. "I've seen cases where neighbors have fought for years about parking or the color of a house," he says. "The tree is just an excuse for an argument." Sausalito attorney and mediator Barri Bonapart, one of a handful of lawyers in the country who specialize in tree-related disputes, agrees. "There's always an underlying issue that gives rise to a dispute," she says. ""People harbor resentment and the trees become a lightning rod for disgruntled temperaments." While many of the laws regarding trees are based on common law and basic legal principles such as ownership, negligence and nuisance, the issue in California is more complicated. Local cities and townships have enacted hundreds of tree laws, some of them diametrically opposed to those in neighboring cities. Mill Valley, for example, classifies and protects redwoods as "heritage trees." 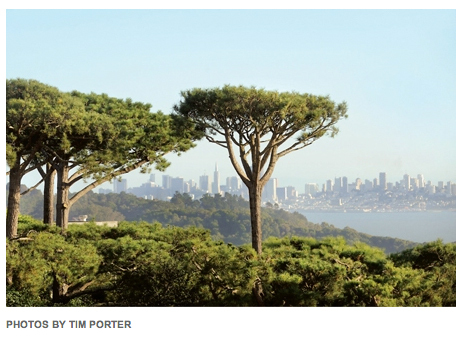 Sausalito, though, has a "right to a view" ordinance and designates the fast-growing redwood as undesirable. In 23 years of practicing tree law in Marin, Bonapart has litigated all sorts of cases: blocked views, damaged property, injured people, cracked driveways, and even trees that were murdered or kidnapped (that is, burned down or stolen). While her clients include tree-care companies, municipalities and businesses, the majority of her cases, and the ones increasing the most, are neighbors in dispute with neighbors. "There's the old Marin and the new Marin," Bonapart says. "The new people can tend to have a little too much money and an overdeveloped sense of entitlement, as in 'what's mine is mine, and what's yours will someday be mine as well.'" Ironically, while many of Bonapart's cases concern the "new Marin," many of the current tree conflicts result from the flawed judgment of the "old Marin." In the 1950s and '60s, local housing developers planted thousands of fast-growing pines and cypress throughout the county. At the time, these pop-up forests made the new homes more valuable. Today, many of these trees have outgrown their root systems and are at risk of falling over. They are lawsuits waiting to happen. 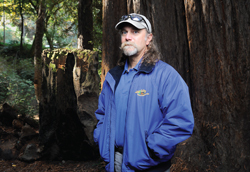 "People planted trees foolishly then and they still do," says Rick Misuraca, superintendent of parks in Mill Valley. "It's not an issue at the time because they plant for short-term benefit. It's the homeowners decades later who have to deal with their driveways being pulled up by poplar roots or their neighbor's redwood falling onto their house in a storm." Misuraca is responsible for Mill Valley's 60,000 city-owned trees as well as for ensuring that homeowners obtain permits before removing or planting trees. Owners can tear down any tree, he says, as long as it's for the right reason. And while just about any reason will do if the tree is an invasive, non-indigenous species such as eucalyptus, it's more difficult when the tree is classified as a heritage tree, such as a redwood or a madrone. To cut down a mature redwood, Misuraca says, the owner must prove it's either dying or a safety hazard. Homeowners may also plant any tree, but Misuraca urges residents not to sow foolishly, lest they reap trouble years into the future. "When someone asks about planting a tree, I ask them what they want it to do," he says. "If they want to screen out their neighbor's 20-foot-tall house, they don't need a redwood that will grow to 120 feet." Similarly, if the tree will be near pavement, Misuraca recommends not using species with aggressive or shallow root systems—the liquid amber, for example. "It's a pretty tree with bright fall colors, but eventually it'll break your sidewalk." Mill Valley resident Jane Parker (a pseudonym) encountered this in 2007 with a curly willow tree her neighbors had planted just inside their property. One day she noticed that the tree's roots were buckling the earth under her brick path. When she asked the neighbors to move the tree, they declined. Parker hired Bonapart and spent thousands on fees and surveys, including a report from Moritz confirming that the tree could cause substantial damage. But before any litigation could start, fate intervened. In January 2008, a heavy windstorm sent the tree crashing through Parker's roof. "It would have killed my daughter if it'd fallen one inch over," says Parker, who has since sold her house and moved. She was so tired of the controversy she moved without seeking damages. What's a tree or a view worth? Lawsuits often arise when homeowners skip the permit process and take matters into their own hands, not realizing the extent of their liability. "They'll cut down a tree, thinking, 'It is easier to beg forgiveness than seek permission,' and then the valuation comes in at tens of thousands of dollars," says Bonapart. Because statutory multipliers are or three times the value of the tree, damages add up quickly. Determining the value of a tree is part of Misuraca's job. He uses an equation determined by the International Society of Arboriculture that factors in diameter, species, condition and location. The going price for a healthy, mature redwood could be up to $40,000. But if a redwood is worth $40,000, the view it blocks can be worth even more. "It's important to take pictures of your view before your neighbor's tree starts to block it," says Sausalito attorney Ben Kilgore. In one case in Mill Valley, his clients asked neighbors to cut down a row of trees that blocked a valley view. They refused. "It's easy for these issues to get contentious," he says, "because both parties believe they're right." In this case, a compromise was struck: the owners kept the trees trimmed at 20 feet tall, just low enough to protect the view, and both neighbors split the cost of the trimming. They keep a 20-foot measuring staff on hand to avoid any future disputes. Hillside cities such as Sausalito and Belvedere, where property prices are linked to views, have ordinances that help protect a homeowner's view. This can mean "leveling off" tree lines at a certain height or "windowing" a large tree — cutting a hole through the branches so the view shows through. In cities with view ordinances, tree litigation usually means demanding damages not for the value of a tree, but for the price of the view it blocks — and that price can be hefty. Curt Thor, president of North Bay Real Estate Appraisals in Novato, has been appraising Marin properties and their views for 17 years and recites a long list of considerations: Is the view uninterrupted? Is it 360 degrees? Which direction is it facing and from which rooms? A view from an upstairs closet isn't nearly as valuable as one from the living room or hot tub. A western view of the sunset might be compromised by fog and wind. A view of San Francisco's Financial District commands more than a view of the avenues. Moreover, says Thor, the value of a view is subjective and depends on the personality of the homeowner. A sailor, for example, might pay a premium to live above Tiburon so he could see boats below. Someone who craves privacy might prefer a Mount Tam hideaway with a view of San Francisco. Thor does his best to evaluate views based on asking and selling prices of similar homes in the area. When a home's view is obstructed, he has deducted up to $1 million from its value. Tree law experts believe the next big point of conflict will involve solar panels. The California Solar Shade Control Act stipulates that a tree must not shade more than 10 percent of a solar installation's panels between 10 a.m. and 2 p.m., but Bonapart points out that the statute was recently rewritten to exempt pre-existing trees even if they did not shade at the time the solar panels were installed. "We haven't heard much about this issue yet because up until recently, the technology was too expensive for most homeowners," she says. "Now we're seeing more and more installations and the recent amendments will likely be a breeding ground for disputes." In the residential solar cases she's handled so far, Bonapart has been successful in helping the parties to reach agreements in virtually every matter. Moritz dreads the idea of cutting down trees to protect solar panels. "The leaf is by far our best solar collector," he says, "while solar panels are in their infancy. Why should we automatically defer to the man-made option?" No one has analyzed the tree's energy contribution, he adds, which includes carbon sequestration, shade and wind protection. "We need to look at all the environmental considerations before cutting down more trees." Bonapart and Moritz hope that future changes to the solar shade act (which Bonapart considers "on the cutting edge of law") will take into account both sides of the issue. They stress that it's never too late to cut back and maintain a tree and, as with all other tree-related disputes, advise addressing these concerns sooner rather than later. 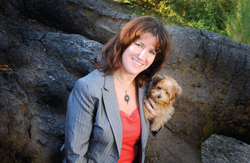 "As with most problems, tree disputes do not improve with age," says Bonapart, who almost invariably encourages her clients to attempt a collaborative resolution, such as mediation, before taking an adversarial approach. "Litigation between neighbors ought to be a last resort," states the Sausalito attorney. She adds, "following the Golden Rule is not only the right thing to do, it is usually the most effective." Reprinted with permission from Marin Magazine. © 2009.